Endless queues, unnecessary delays, annoying passengers, lack of privacy and little leg room are some of the discomforts that plague us when we fly commercial. Most times, it makes us wish we had our own private jets to splurge around the world when ever and how ever we want. But for some of the world’s celebrities, that wish can easily be turned into a reality. While uber first class cabins like Etihad’s Residence have succeeded in reducing these discomforts to the barest possible minimum, some elites still prefer to travel in their own jets. They clearly have no tolerance for commercial airline drama, not to mention the trouble of having to snap selfies and sign autographs for the multiple fans that would swamp them and the paparazzi. Arrrghh!!! While some celebrities can only afford to rent a jet when they need it, others show just how rich they are by owning one, two or more private jets. What’s more? Some of these celebs even have their own pilot’s license and therefore can afford to trot themselves without limits. How Cool is that? Without further ado, let’s take you through some luxurious celebrity-owned private jets. When you are the leader of the money team (TNT) not one but two private jets would do. The “retired” pro boxer bought his second private jet, Air Mayweather 2 in June 2016. It is a 12-seat Gulfstream III with interiors featuring gold accents and a fully stocked kitchen. Though Mayweather didn’t reveal how much he bought it, jets of this calibre are said to worth around $40 million. Renowned Chinese actor Jackie Chan bought his second private jet in February 2016 for $20 Million. He became the first to purchase the Legacy 500 which as of 2017 is Embraer’s latest flagship. The mini-jet has the capacity to carry between 8 and 12 passengers. Its amenities include two 19-inch HD screens, WiFi connectivity and HD entertainment systems. Chan’s first jet is the bigger Legacy 650. The ace actor revealed that he would be using the Legacy 500 for shorter routes and the Legacy 650 for transoceanic travels. When you’re married to a Queen, then there are no limits to the kinds of gifts you stand to receive. For Father’s day 2012, Beyonce bought her husband Jay Z this luxurious present. Price tag? $40 Million. The jet which can seat 15 features a living room adorned with fine leather, a bedroom two bathrooms and a well-equipped kitchen. Star Wars star Harrison Ford has not one, two, three… but a whopping 8! private jets. A certified pilot, Ford once described flying as good music. The most known among his fleet is the Cessna 680 Sovereign jet (pictured) which has the capacity to seat 12. A transcontinental aircraft, it has a top speed of 848 km/h. His other aircraft include; 929-vintage Waco Taperwing, Beechcraft B36TC Bonanza, Aviat A-1B Husky, DHC-2 Beaver, Cessna 208B Grand Caravan, Cessna 182, and a Bell 407 helicopter. NBA legend Michael Jordan continues to bank top dollar thanks majorly to his record-breaking Nike deal. His Gulfstream 5 is said to be worth around $50 million. The jet previously featured a blue and white theme but in February 2017, MJ gave the jet a customized elephant print paint job modelled after his Air Jordan 3 sneakers. The jet also features tail number the N236MJ complete with the Jumpman logo. Woods flew commercial in early 2017 and it made the news. It was the first time in 10 years that the 14-time major golf champion was ditching his $54 million Gulfstream G550 which he uses for both short and long-haul trips. The 18-seat jet can reach an altitude of 51,000 feet and fly for more than 12,000 km nonstop. To show his love for aviation, John Travolta built his Ocala, Florida house complete with two! runways– a feature that qualified it for our list of 30 most-jawdropping celebrity mansions. Like Harrison Ford, Travolta is a certified pilot who has solely flown over 35,000 miles. His fleet of 7 includes; 3 Gulfstream jets, Bombardier Challenger 601, DC3, as well as Boeing 707 and 727. The most expensive of them is the Boeing 707 which formerly belonged to Australia’s Qantas, a company for which he became an honorary pilot after completing their course. The Queen of all media is no stranger to luxe living and the views of her $14 million Colorado mansion is just one of the many testimonies. Oprah owns multiple real estate properties across the nation and she swaps among them via her $42 million customized Bombardier Global Express XRS. Powered by twin Rolls-Royce BR710 engines, the jet is known for its efficiency with long haul flights. It can travel for 16 hours nonstop without needing a refuel and can reach a maximum altitude of 51,000 ft. The interiors which can seat between 8 and 16 passengers is luxuriously adorned. Other celebrities owning the Bombardier Global Express include Canadian songstress Celine Dion and billionaire filmmaker Steven Spielberg. The Grammy-winning singer is seen here with her late husband René Angélil. We’ve seen Tom cruise jets in blockbusters like Top Gun, turns out he owns one of those toys for himself too. Cruise’s Gulfstream IV has an estimated worth of $36 million. The jet can seat 14 passengers and reach a maximum altitude of 45,000 feet. It can cover about 5, 000 miles without needing a refuel. 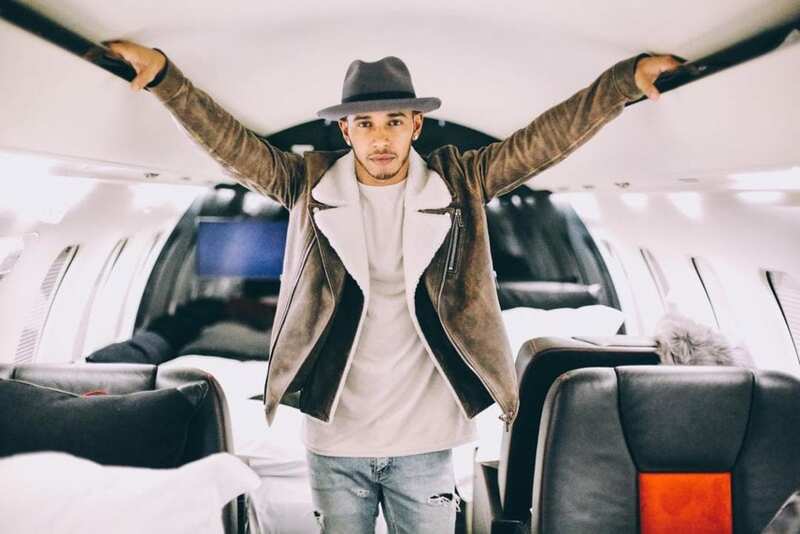 Lewis Hamilton bought this executive jet for $30 million back in 2013. The F1 star made the purchase in order to ease his busy schedule and also be close to his then-girlfriend ex-Pussycat Dolls leader Nicole Scherzinger who lived in LA while he was in Monaco. Powered by 2 General Electric CF34-3B engines, the jet has a top speed of 540 mph. Hamilton customised the jet with his initials written at the vertical tail wing– G-LCDH, which stands for Lewis Carl Davidson Hamilton. The 10-19 seat interiors include a bar and a galley. There are also several plasma screens for entertainment. Hamilton does not shy away from posting the interior snaps of his toy on social media. After an incredible rise from rags to riches, Jim Carrey is enjoying the fruits of his relentless labor. His Gulfstream V said to be one of the world’s highest performance jet with a top speed of 966 km/h is worth almost $60 million. Actor, filmmaker Tyler Perry owns a Gulfstream III. However, while the actual jet has never been photographed, it was reported that he lent the jet to Bobby Brown to travel from LA to Atlanta so he could be by his ailing daughter Bobby Kristina Brown’s bedside, after learning of her hospitalization. It is alleged that the same jet was used to transport the body of Brown’s ex-wife Whitney Houston from Los Angeles to a New Jersey Funeral home upon her 2012 death. Other Celebrities known to own a private jet includes; Angelina Jolie (Cirrus SR22), Arnold Schwarzenegger, Mel Gibson, Morgan Freeman and more. Trump is a billionaire and truly knows how to live like one. He bought his Boeing 757 from Microsoft and Vulcan Inc billionaire Paul Allen in 2010. The interiors are nothing short of luxury, featuring 24-carat gold taps and seatbelts, a galley as well as cream leather seats. For entertainment is a 57-inch high-definition TV screen. It is valued at $100 million. Trump’s other jets include Cessna Citation X business jet and two Sikorsky S-76Bs. After becoming America’s president in 2016, Trump had to ditch his jets for Air Force One’s better secured Boeing 747-200B. Russian oligarch Roman Abramovich is known for his luxurious lifestyle. His 201-foot-long Boeing 767-300 includes a missile avoidance system that bests the one available on the Airforce One. The aircraft can seat up to 350 in a commercial arrangement, but Abramovich remodelled his to include master bedrooms, bathrooms with showers, and a 30-seat dining room. AKA The Bandit, the jet features gold accents. The Chelsea FC owner also owns a couple of super yachts. World’s richest man Bill Gates spent $45 million to acquire the jet he describes as his “guilty pleasure.” AKA Global 500, the jet comes with one of the best aviation technology. It has a maximum speed of Mach 1 and can travel 9,300 km nonstop.